The brown dwarf is now nearer Mars orbit than Jupiter orbit on an inbound trek around the sun on Mercury's orbit. The brown dwarf will break through the solar ecliptic plane on March 4, 2011. The first of three conjunctions takes place on March 15, 2011 where earth has a near-seven body alignment that includes the mystery NASA comet. Click on the link and click the arrows back and forth and watch Elenin/Planet X/Nibiru (more facts) entering the innermost parts of our solar system. March 4th, 2011 marks the day that the brown dwarf (info) breaks through the ecliptic plane into the northern hemisphere to begin influencing the earth into convulsions and severe spasms. Earthquake and volcanic activity will escalate from this time forward and increase like birthpangs where the earth groans and the oceans slosh tidal waves too and fro. Feb 11 Nibiru between Jupiter and Mars orbits. 2.66 AU from Earth. 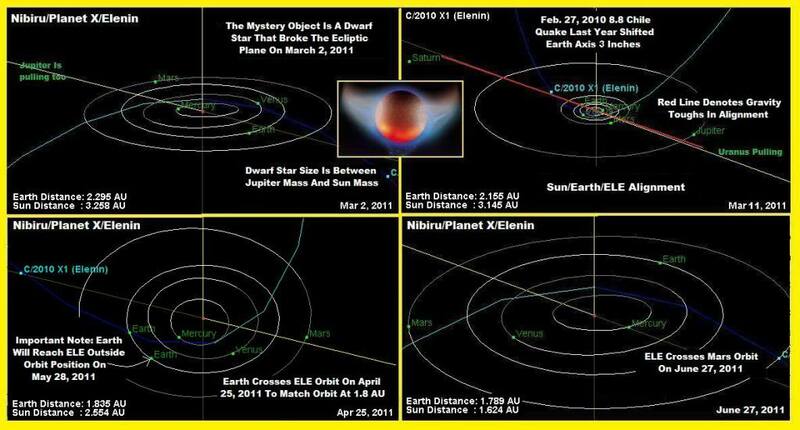 March 4 Nibiru breaks through solar ecliptic plane to enter northern hemisphere. 2.26 AU from Earth. and pole shift event. First Conjunction. 2.09 AU from Earth. June 30 Nibiru crosses Mars orbit. 1.77 AU from Earth. Aug 3 Nibiru crosses Earth orbit and Earth reaches Nibiru perigee position. 1.48 AU from Earth. Aug 18 Nibiru crosses Venus orbit. 1.24 AU from Earth. Sept 11 Nibiru reaches perigee position at Mercury orbit. [b].70 AU from Earth. 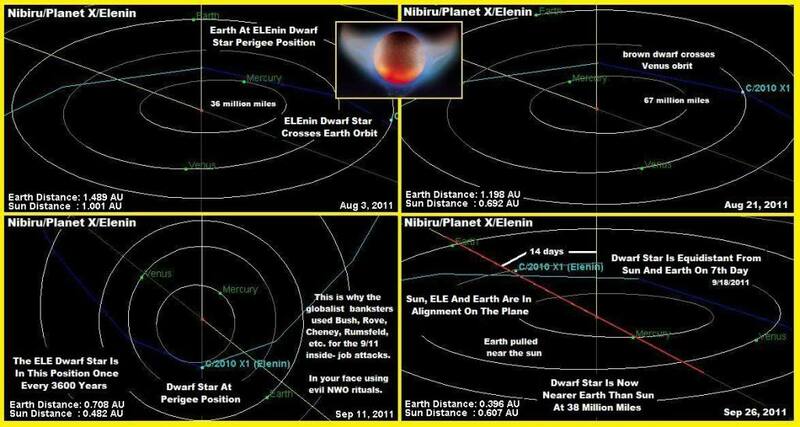 Sept 25 Nibiru equidistant from Sun and Earth. Second Conjunction. .40 AU from Earth. 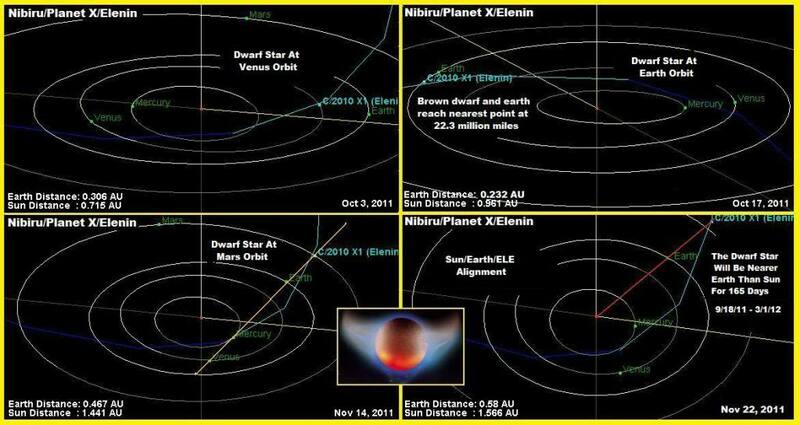 Oct 2 Nibiru at Venus orbit. .316 AU from Earth. Oct 17 Nibiru at Earth orbit and nearest position. .24 AU from Earth @ 22.3 million miles. Nov 14 Nibiru crosses Mars orbit. .47 AU from Earth. Nov 22 Nibiru, Earth and Sun alignment for third and final conjunction. .57 AU from Earth. Nibiru will finally be farther from the Earth than the Sun on March 1, 2012 marking 165 days from Sept. 18, 2011 that Nibiru was nearer earth than the Sun. Carol, I really appreciate all your hard work around here to keep us informed. We're all gonna die!!! Oh, and buy silver. Hey there CO... everyone dies but not today or even this year as many of us still have things to do. I do have a confirmation that Yellowstone is going to have a small eruption on March 15th from other sources so that seems to be on the agenda. However, I just don't see a pole shift yet. And I do see many of us anchoring the influx of energy pouring into the planet as this sort of solar flare could take out grids in the past. The important part is not to buy into fear and just stay in the present moment. The other part of all of this is that loss of life will be at a minimum. Just has it has been in other major catastrophic conditions.. prayer works wonders and can keeps people safe. I've been in the heart of several disasters and almost no loss of life occurred where it could have been devestation. The 89 quake in San Francisco, the big quake here on the islands and elsewhere. Earthchanges can occur and the frequency of the people on the planet can rise helping the planet through all of this change. The old paradigm in crumbling, it has to as it is leading to extinction of life through pollution. This cannot be allowed to continue and people everywhere will be moved to rebuild something better. is touching the brick wall. Carol is all of this post for REAL!! I haven't checked all the links yet however this is rather scary stuff! Is an astronomer responsible for all the pics. Worst of all do I have to move again even though its been on my mind. I took a look at some of the links last night Jenetta, most of the comments following Terrals post are quite negative and he apparently doesn't command much respect from other forum members. Virtually no one agrees with this information, including one guy who appears to be from NASA with his own information discrediting the Elenin comet of doom talk. Some of the videos aren't professionally produced either...so it makes it difficult to say what's true and what's disinformation meant to discredit Terral's info. It is interesting that the government may shut down after March 4...is all that some kind of distraction meant to cover-up or divert our attention from something else going on in the background? I provide data of fact, not conjecture or hyperbole or pathological lying. Since you do not have a space program, an ISS, A shuttle program, a satellite program, a telescope program, a spectra program, a NEAR program, and have no data whatsoever to offer, then, it is a waste of time. Insulting you is also a waste of time as well. I will correct you in your silliness, but not respond any longer. Until you do acquire those assets, your "data" and "work" is utter silliness and not even considered. The 100% response by all these myriad of critical thinking people who post here is testimony of this, to your crazy silliness. A terrible waste of bandwidth as well. Too, in our time, NASA is the only source we have and its worldwide contributing partners, and the millions of technical data it provides freely to the rest of us, so we can learn, know, and understand better the great mystery of what lies out there. You refuse to use any of this whatsoever. It lends a sense of creepiness to you that would be better served with a 12 gauge. I will post this post, simply to every psychotic thing you post. It requires no further commenting by me or anyone else. Ask yourself; if this incoming was real, why is it only you that can see it. And also, it would be visible in the night sky, and should have been for the last 3 years. But there is nothing. Nothing at all. When you get real and clear minded and can think as a human being, we can re-convene. It is impossible to talk to a wall. Thanks for the follow-up research. I really appreciate getting the additional info. I did not agree with Terrals conclusions as to what will happen when all of the planets along with the sun on the 15th will create a pole shift, tsunamies and some of his other dire speculations. Nicolai said Yellowstone would erupt before Kilauea. He also said the economy would tank before Yellowstone erupts. So I suspect with the planets lining up tension will increase across the planet. I like to monitor where the quakes are showing up worldwide. The main thing with Yellowstone or with many volcanoes is that harmonic tremors generally are present before an eruption takes place. As for the pole shift we had already discussed this in another thread and none of us sensed this happening at this time. I do wonder what is going on in the fall if the data pertaining to the youtube link is accurate. I also followed a few of Terral''s links after I had collected the info (youtube) and thought that he was a bit dramatic. Meaning he seemed to discredit himself with the conclusions he was coming up with based on the planet/solar alignment. Meanwhile, right after posting this I saw the volcanic activity in Africa and was a bit taken aback as there were warnings of eruption of Mt. Nyiragongo volcano in the Congo. Even watching the solar flare/CME go across the planet it first hit South Africa... followed by this news about Mt. Nyiragongo volcono and numerous other volcanoes all rumbling. Terral may not be the best messenger and his speculations are way off base. However, the data about the planet/solar alignment if based on fact is significant and what really caught my attention was that Nicolai (ET) was also saying that Yosemite would erupt (however, no pole shift now like we thought) on March 15th. The New Madrid rumbled early this morning. I'm in Lexington, Kentucky. I woke up and checked the clock, but being in my usual stupor, I can't remember if it was just before 4:00 am or 5:00 am EST. I have felt similar small quakes down in Georgia, and this one lasted about half a minute, much longer than before. I'm trying to see if there are any reports that match my time frame but I'm not sure if it is the one noted for Arkansas or for Indiana. Anyway, the New Madrid spoke to me and I'm hightailing it back South to Georgia. I spoke to my son in Seattle yesterday about Mt. Ranier. He didn't know there was activity. He looked out of his penthouse apartment, straight at the mountain. He said he'd call me if he sees any smoke. Prayers for Daniel, please, as living in a glass tower is not really a good idea in my opinion. 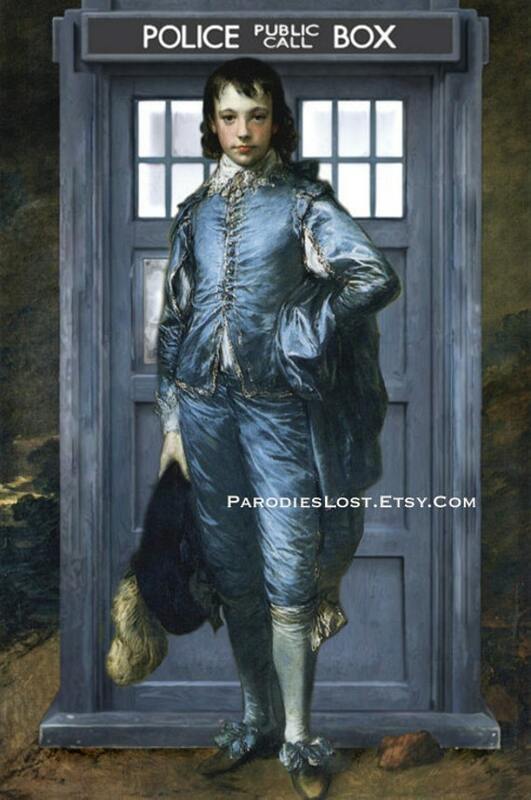 He thinks my attention to these matters is over the top, and he is wholly unprepared. Side note: Daniel is being heavily recruited by Google as a computer engineer. I'd love to find out the inside story, that's for sure. I sense a lot of of intended confusion here. The problem with the NASA posters, is that..
1) I'm sure all in the know and have access have been given gag orders. 2)Despite gag orders, they are dismissing/discrediting others information. 3) NASA and other industry affiliates have not said anything about nothing regarding this object up until recently via mainstream outlets. However, this object has been discussed for roughly 8 years by some, and more by others. NASA just now acknowledging it's likely existence is discrediting of this institute and it's employees all on it's own. It Doesn't matter about keeping down panic. Just as was communicated recently, there was no panic, therefore, they could have told us much earlier. The question then becomes, why not and why now? 4) Now, ignoring an almost necessary gag order and posting your employment position and department with NASA, thus eluding to you being allowed to and NASA being quite comfortable with you addressing forum posts is revealing in itself. It says a lot. Pay attention to the details. 5)The only reason NASA would come forward with the public acknowlegement of a new body in our solar system, is because eventually one way or another, home star gazers, and the public in general will see it. 6)Always focus on what the eyes, heart and common sense show you in this regard. The eyes are seeing a lot in terms of well above normal activity occurring across this planet. NASA couldn't post on any forum and convince me of anything different. They're not that clever. There is much more in terms of factual actions that the Government, NASA, and the Military has taken over the last few years that immediately, tell you that something is afoul. In the first half of Wednesday's show, physicist and author Stan Deyo shared updates on Planet X, the current pole shift, and extreme weather, as well as discussed 'End Times' and the Antichrist. The jet and gulf streams are broken and we're looking at a mini-Ice Age, such as what happened in the 1600s, he said. During the solar cycles of 2012-13, we could see some intense activity, possibly tying in with End Times prophecy, he noted, citing how Hopi prophecy talks about a time that the sun is so hot that trees and grass will catch fire. Thanks JT. I'll take a look. Hence...confusion reigns King on that thread. Jester, I listened to that Coast to Coast interview last night..GREAT interview! Chalked full of very interesting information. Love Stan Deyo! He also is just now coming round to believe in Planet x too...interesting. And like Brooks Agnew agrees that there are several Planet X's in and around our solar system, including the Dwarf Sun traveling with it's own mini solar system of which are home to Nibiru and the Annunaki. Stan talked about the fact they live inside the planet garnering their heat source from the core. Also be sure to stay tuned for Prof James McCanney who has some interesting things to say too. Stans discussion about the sun getting very hot is also mentioned by others too...Ed Dames talks about it from remote viewing episodes. That is quite disturbing...I really, really hate the HEAT, left the lizard people behind in Dallas because it was too hot there in the summers. The next evening on the 17th Noory interviews Hugh Newman on energy grids, with a special appearance from Richard Hoagland. They have some very interesting things to say about what's going on in Cairo and Madison, WI that what's happening in both places are inter-related somehow on a frequency level and a change in consciousness. Thanks for all your hard work in bringing this information to us Carol, you really have a gift for pulling it all together! 4) Our guess might just as well be as good as NASA's - If Never A Straight Answer wasn't interested in the opinions of the 'amateurs' in the field, they wouldn't bother to communicate at all. Apparently they are interested, & therefore they tickle the www. If the above conclusions are correct, any possible answer/piece o/t puzzle which will take us closer to a solution of that what we're facing here, is welcome. You are more then welcome. This sort of thing has been a hobby of mine for years. I started off looking for data in researching my books (which I want to get back to writing). Having worked for country government I know for a FACT that they deliberately withhold important health related information and only provide such information when they determine a NEED TO KNOW. I've never been in agreement with them as many of these decisions were based on the economy of the business man and not on the the welfare of the public... until the very last minute, if even then. Government likes to keep the public in the dark. So of course knowing first hand how they operate, I don't believe any of them as their credibility went down the toilet with me many moons ago. Thanks for your reply Carol and the research...an interesting tidbit I picked up today from a article on travelling... someone in the Southern Gulf Islands... featured in the local daily, is that the islands are experiencing low tremour earthquakes here on the West Coast. I plan to go housesitting to one of the islands end of March for a couple of weeks so I am crossing my fingers there is nothing spectacular until later in the year. I don't own a boat. Remember when Mt. St. Helens blew in the early 80's...I was living in Victoria which has Juan de Fuca Strait between Vancouver Island and Washington...everything shook that morning with pictures falling off the wall...huge bangs like cannon firing and I fell out of my bed . Jednetta, Nicolai said there wan an underwater volcano there in the gulf which I suspect may be connected with whats going on in the Madrid area. He also said the active period would be mid March to the end when a number of earth changes will occur and he said that pole shift has been gradually happening already. I continue to worry about deliberate negative interference with our solar system. This can be in the form of open attack, open enslaving rule, or hidden earth-changes. It matters not. I'd like the BadAss SuperPowers to take their fight outside of this solar system - and keep it outside of this solar system. Obviously, I don't know the inside story, as I continue to passively promote a Namaste Constitutional Responsible Freedom United States of the Solar System. I continue to fly blind, barefoot, and stupid - but I continue to venture where angels fear to tread. I've thought it might be cool if Nibiru (if it really exists, as advertised) could somehow alter it's trajectory, to assume a relatively circular orbit - 1 AU beyond the orbital path of Pluto - and become a part of the United States of the Solar System. I know not what I say - but I still think this is sort of cool to think about. Retired 'Green Beret' John R Moore explains what is really behind the effects of climate change and why the elite is covertly preparing for violently rising ocean levels. He exposes the cover-up of an extinction level threat due to the approaching star (The Destroyer) and its planets. This is vital information for you and your family. His website is: http://www.helibertyman.com You can listen to 'The John Moore Show' on 'The Micro Effect' http://www.themicroeffect.com Monday through Friday 7-8 AM Central. Please see their archives for older shows: http://www.themicroeffect.com/index1.htm which requires a subscription, but for 20$ you can download all. Listen also to 'The John Moore Show' on Republic Broadcasting Network http://www.republicbroadcasting.org on Sundays 4-5 PM Central to catch the newest information in this developing crisis. Sheldon Day from 'The Light of Day' radio show does a good job on archiving John Moore audio files. See his archive here http://thelightofdayradioshow.com/archives/archivesmisc.html. A troubling brew of manmade and natural disasters are pushing today's headlines from grim to grimmer and many now wonder if the prophecies of global cataclysm are coming to pass. This is why the ranks of those experiencing 2012 precognition through dreams, premonitions and other supernormal means, are soaring. Are you wondering if this is you and if we can endure and prevail all this without fear, dogma and hate? If so, take heart because we can, and this free video program explain why. Lucus appeared on Coast to Coast Monday evening, most of the show was dedicated to Planet X/Nibiru. Also talks about Yellowstone, incoming fireballs, USGS deleting info and much more. Interesting stuff. I still need to check out the videos, but I curious. In the supposedly image of Nibiru, where are the stars that would be in the back drop? It shouldn't be pitch black around the planet and moons, unless it's in some sort of dark debri cloud??? I don't know. If it wasn't for all consistent revelation from the ancients, I could surely see the ptb using a rogue planet as an excuse to fire off HAARP weaponry. Seems legit, but my antennas are always up.